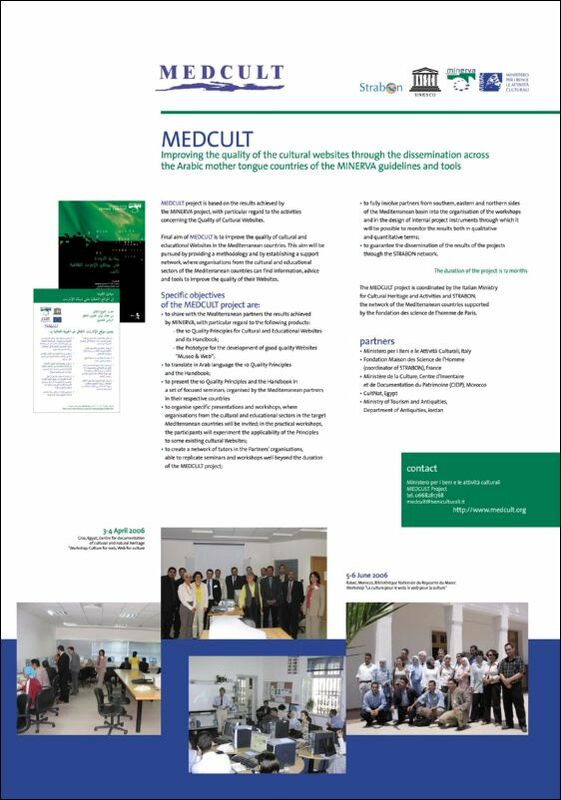 The project MEDCULT aims at improving the quality of the cultural websites through the dissemination across the Arabic mother tongue countries of the MINERVA guidelines and tools. This goal will be pursued by providing a methodology and by establishing a stable support network, where organisations from the cultural sector can find information, advice and tools to improve the quality of their websites. These actions are fundamental to improve the awareness of the importance of assuring reliability, transparency, and accessibility to an even wider public of the cultural and ducational contents provided through the web, in order to contribute to information literacy and capacity building. The Information for All Programme provides a framework for international co-operation and international and regional partnerships. It supports the development of common strategies, methods and tools for building a just and free information society and for narrowing the gap between the information rich and the information poor. The aim of Minerva is to create a network of Member States' Ministries to discuss, correlate and harmonise activities carried out in digitisation of cultural and scientific content, for creating an agreed European common platform, recommendations and guidelines about digitisation, metadata, long-term accessibility and preservation. The STRABON programme, part of the EUMEDIS initiative, is the result of a funding agreement between the European Commission and the Maison des Sciences de l'Homme (MSH), a not-for-profit foundation. The foundation has gathered together, within the STRABON consortium, 19 partners from 4 countries on the north shore and 8 countries on the south and eastern shores of the Mediterranean. Its total budget amounts to 3.7 millions of euros, of which 80% is a European subsidy. In France, the Ministry for Foreign Affairs, the Ministry for Culture and Communication, and the Ministry for Tourism have joined the programme within the framework of an inter-ministerial accord. The programme is scheduled to last 40 months, between the years 2002 and 2005.